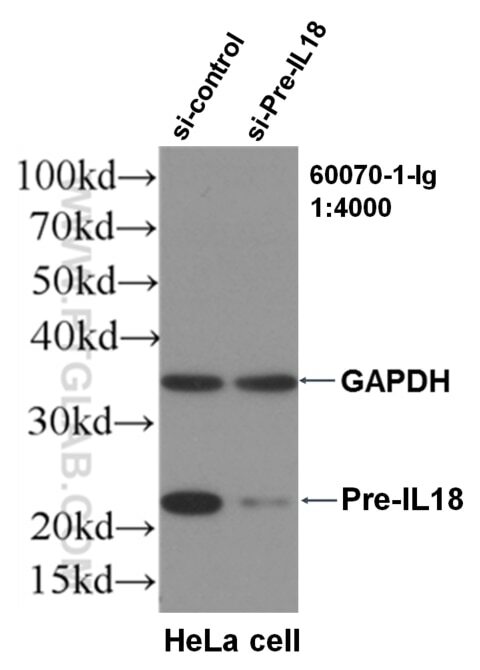 WB result of Pre-IL18 antibody (60070-1-Ig, 1:4000) with si-Control and si-Pre-IL18 transfected HeLa cells. 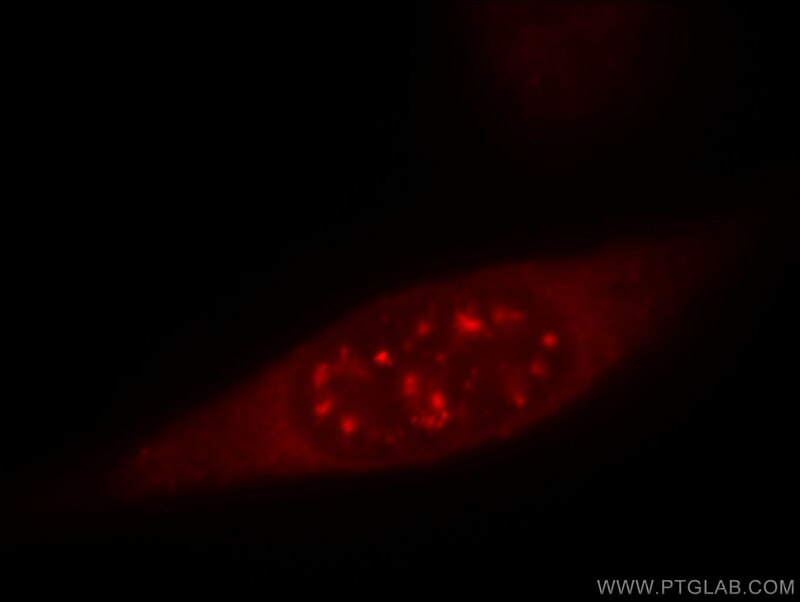 Immunofluorescent analysis of MCF-7 cells, using IL18 antibody 60070-1-Ig at 1:25 dilution and Rhodamine-labeled goat anti-mouse IgG (red). 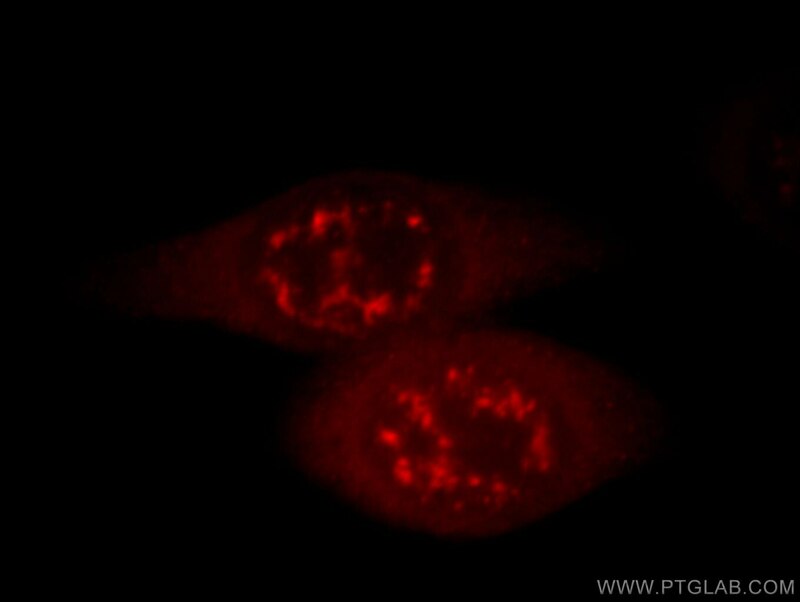 Immunofluorescent analysis of Hela cells, using IL18 antibody 60070-1-Ig at 1:25 dilution and Rhodamine-labeled goat anti-mouse IgG (red). IL18, is a proinflammatory cytokine involved in the development of Th1 cells and in immune response. It can stimulate the NK cells and certain T cells to release interferon gamma which plays an important role in activating the macrophages or other cells. IL18 has been demonstrated to have the potential to enhance Fas ligand-mediated cytotoxicity, which is increased in PE and regulates placental apoptosis. IL18 is synthesized as a 24 kDa precursor and then cleaved into a biologically activate 18 kDa form.